I’ve been reading up on World War II scrap drive efforts in the United States, and am wondering if these (mostly) community-based efforts actually contributed enough raw materials to the war effort for them to actually be viable? Meaning, I am assuming that these drives brought communities together and provided a sense of “I am doing something!” for the war effort, but if—all things being equal—no recycling happened past the usual efforts a community has, would the war effort have been stymied as a result? If a neighborhood didn’t collectively scrap their iron fences, would a tank truly have not been built as a result? All of these pieces talk about the scrap drives matter-of-factly as being a “thing” but none really address whether or not these efforts were simply “team building” exercises at best? They all seem to implicitly agree that scrap drive efforts were necessary. So are there any citable (and hopefully fact and statistic backed) sources out there that focus on the idea that these scrap drives were more of a morale boosting effort than a truly necessary act of sacrifice for a war effort? 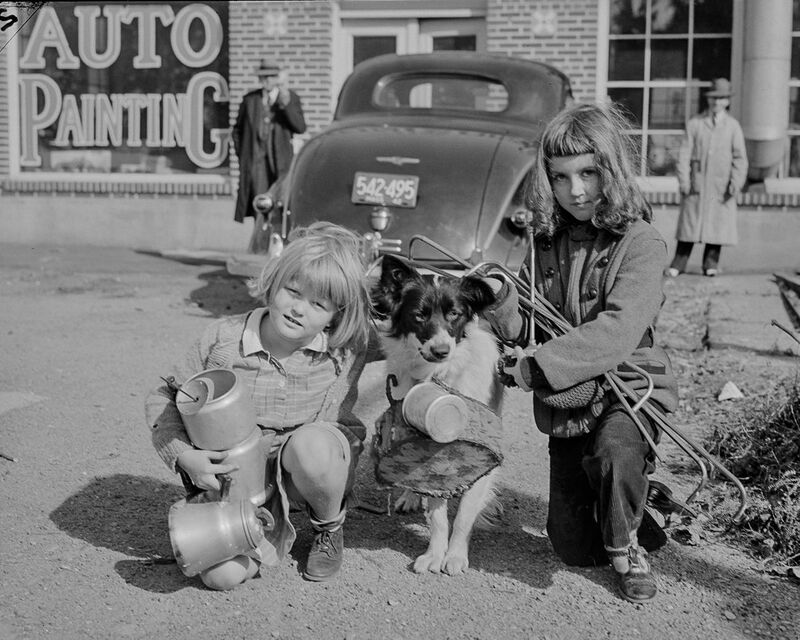 Including a cool pic (below) of a dog and two kids collecting scrap items (presumably) around Boston just for the hell of it. For the "procurement of raw materials" the United States could have continued just like before and still win. Effectively it might have been useful still –– for quite some other reasons. Just like in the First World War the United States had a vast advantage in access to raw materials and industrial capacity over Germany and of course over resources starved Japan as well. Most Americans, including many Ohioans, actively participated in scrap drives to help the United States attain victory in World War II. They viewed it as their patriotic duty to contribute their time and their products. Historians, however, debate how necessary scrap drives were and whether or not they helped the United States defeat Germany, Italy, and Japan. The government did find uses for many of the donated items. Products made from rubber helped the war effort, but recycled rubber proved to be of an inferior quality to naturally occurring rubber. The development of synthetic rubber did more to help the United States win World War II than the scrap drives. Recycled aluminum also proved ineffective, although industry melted down iron and steel products to make various weapons. Perhaps the greatest item collected in scrap drives was kitchen fat, an item necessary to produce glycerin. Glycerin was a vital component of bombs and other types of explosives. While the scrap drives' effectiveness remains under debate, the drives helped unite the American people behind the war effort and allowed the United States to defeat Germany, Italy, and Japan in World War II. But this is a complex issue. StraightDope –– Were WWII scrap drives just a ploy to boost morale? It turns out that the scrap drives, and the propaganda and patriotism that accompanied them, had a far more limited impact on the economy than might be imagined from the enthusiastic portrayal of them in the historical literature. While the impact of the drives on the economy was limited, the impact of the drives on civilian morale, may well have been substantial. The patriotism that surrounded the drives, moreover, did not erase the impact of conventional economic incentives. The fat drive was unnecessary, the product of special interests seeking a way around price controls and rationing. The lack of adequate price incentives confused the iron and steel scrap drive and made it less effective than it otherwise would have been. The rubber drive was more effective because this lesson was learned, and a high point-of-origin price for scrap was established. Rather than demonstrating the importance of non-pecuniary motives and non-market means of production, the salvage drives demonstrate the limited ability of patriotism and community spirit to overcome technical constraints, or the tendency of people to respond to economic incentives. Hugh Rockoff: "Getting in the Scrap: the Salvage Drives of World War II", Working Paper, No. 2000-02, Rutgers University, Department of Economics, New Brunswick, NJ, 2000. Revised version Keep on Scrapping: The Salvage Drives Of World War II, 2007 here. The American Industries Salvage Committee confirmed that the production of steel in 1942 would likely end up 5 million tons below the industry's capacity, effectively eliminating the equivalent of 10,000 tanks and 1,300 cargo ships from the nation's arsenal. "We can never regain the lost time," lamented the committee, encouraging every citizen to gather scrap as quickly as possible in order to prevent more letdowns in war production. James J. Kimble: "Prairie Forge: The Extraordinary Story of the Nebraska Scrap Metal Drive of World War II", University of Nebraska Press: Lincoln, 2014, p2. Alongside bond posters, for example, were banners for rubber conservation, victory gardens, scrap metal drives, rationing, armed forces recruitment, and women-in-the-workforce. The bond sales program, however, was easily the largest and “most pervasive” of these campaigns. One internal Treasury study found that more war bond posters were displayed in storefronts than were posters for all other U.S. government campaigns combined. With its massive workforce, obvious government approval, and ubiquitous publicity, the sheer size of the project inevitably helped it stand out against the many competing distractions of the war. James J. Kimble: "Mobilizing The Home Front. War Bonds and Domestic Propaganda", Texas A&M University Press: College Station, 2006, p33. In all probability, the Allies would have won the war had American children done nothing. Children must occasionally have sensed this fact and at times felt they were being kept busy doing nothing of importance. Their work was unpaid and repetitious and, when they ceased to be convinced that their efforts were necessary, they tired easily of it. They felt particularly discouraged when processing plants or transportation systems were overloaded and scrap sat for months outside their classroom windows in great useless heaps. These piles belied the urgency of the WPB’s call for their services and led them to question whether their efforts were hastening their relatives’ homecomings and victory. Like the general public they tired of patriotic slogans and questioned whether their own loose lips could actually sink Allied ships. As early as 1942, several hundred Boy Scouts told interviewers they did not like collecting paper, which they did not feel was needed. Over half preferred to act in more important capacities –– as air-raid wardens or civil defense messengers. Yet, when asked to continue collecting scrap, they persevered. More important than their material contribution is the social and psychological impact of their activities on their generation. First, when teachers called for volunteers, an element of social coercion was implicit. Robert Wm. Kirk: "Getting in the Scrap: The Mobilization of American Children in World War II", The Journal of Popular Culture, Volume 29, Issue 1, 1995, p 223-233. Alexander J. Field: "The impact of the Second World War on US productivity growth", Economic History Review, 61, 3 (2008), pp. 672–694 DOI: This paper considers the productivity impact on the US economy of the period of war mobilization and demobilization lasting from 1941 to 1948. Optimists have pointed to learning by doing in military production and spin-offs from military R & D as the basis for asserting a substantial positive effect of military conflict on potential output. Productivity data for the private non-farm economy are not consistent with this view, as they show slower total factor productivity (TFP) growth between 1941 and 1948 than before or after. The paper argues for adopting a less rosy perspective on the supply side effects of the war. In other words, organizational and technical advances prior to 1942 probably made a greater contribution to the success of economic mobilization than the latter made to postwar productivity levels. Even on the technical (as opposed to production) side, it is notable that there was not a single combat aircraft seeing major service produced during the Second World War that was not already on the drawing boards before it began. […] prior to World War II large corporations had developed considerable expertise in recycling. The paper then covers wartime business-led efforts. The first, efforts to reclaim consumer materials for the production process, were highly visible. The second, initiatives to recycle waste generated by industry, were less visible but even more significant. Within a cultural framework defined by patriotism and an economic framework defined by scarcity, this study finds, corporate recycling efforts succeeded to an extent not to be equalled until after the advent of the environmental movement. Kenneth D. Durr: "The ‘New Industrial Philosophy’: US corporate recycling in World War II", Progress in Industrial Ecology – An International Journal, Vol. 3, No. 4, 2006, p361–378. The reason for this imbalance is that recycling has been organised for mass metals for more than 100 years and works successfully, but not for most of the critical metals. A second problem area is the type and size of the recycled material. Mass metals of Fe, Cu or Al are easily recognizable by their metallic form and color. Many of the industrial metals, on the other hand, are used in inorganic bound and also in very small dimensions. Identifying such components without technical aids becomes difficult even for the expert. Translated from: Bernhard Adler: "Strategische Metalle – Eigenschaften, Anwendung und Recycling", Springer: Berlin, Heidelberg, 2017, p117. The United States were much better prepared to fight World War 2 than the previous conflict. The industries needed for the war effort already had effective recycling and salvage processes developed and in place before the war started for the US. Given that the average civilian effort delivered only very varying quality on a scale that did not matter that much the original assumption of strict "needs for drives" seems increasingly doubtful. Barringer (1954, 54) argued that the drives did bring in additional scrap, and estimated that in 1942 and 1943 the salvage drives yielded about 4,000,000 additional tons of scrap. This was about 8.33 percent of consumption of purchased scrap in 1942 and 1943 and 3.67 percent of total consumption of scrap (Table 1, columns 1 and 2). He adds, "During the entire war perhaps about 9,000,000 tons was brought out that would not have been available to dealers under normal conditions." This was about 9.61 percent of purchased scrap and 4.21 percent of total scrap from 1942 through 1945 (Table 1, columns 1 and 2). Salvage-drive scrap was lighter than normal scrap, and according to Barringer, the mills preferred normal scrap when they could get it (Wall Street Journal, November 28, 1942, p. 1). These percentages, therefore, undoubtedly overstate the yield of the scrap drive compared with a statistic in which the numerator and denominator were measured in tons of scrap of constant quality. Barringer was a long-time official with the Institute of Scrap Iron and Steel, a trade group representing the scrap dealers, and they sponsored his book. As a trade group they had an interest in stressing the contribution of professional dealers. To my knowledge, however, Barringer's book is the best-informed account of the industry during this period, and has a strong claim to authority. Altogether the evidence of the peak-to-peak trend, the regressions, and Barringer’s estimates suggest that the drives added at most a few percentage points to the supply of scrap. How significant was a "small" percentage increase in the supply of scrap? Measured in months of consumption at the 1941 rate, Barringer's estimate of 9,000,000 additional tons, the highest estimate that we have discussed, was only about two months worth of consumption of scrap: without the drives it would have taken two additional months for the private sector to produce and consume the same amount of scrap.12 Measured against total steel production, Barringer's estimate would appear smaller. It amounted to about 1.6 percent of total steel production during the war (Historical Statistics 2006, series Dd399, Dd405 -407). To put it in more familiar terms, this was about 24 days of production. Conceivably, the timing of scrap collection could be crucial. 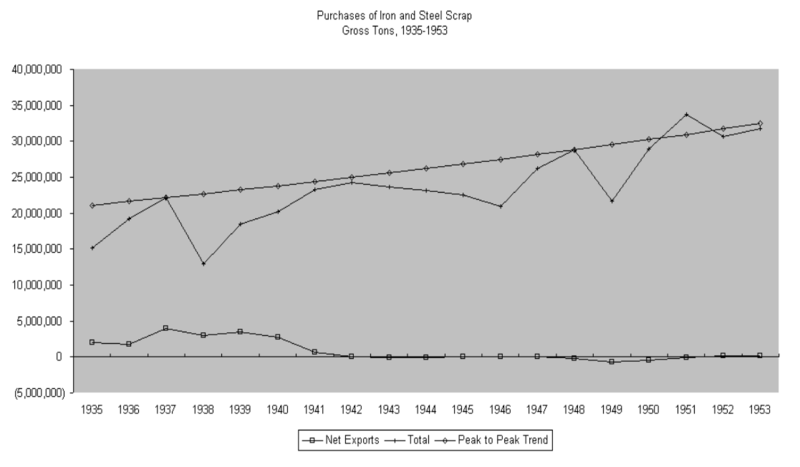 But absent an argument of this sort that magnifies the impact of the availability of scrap at a particular moment, it is clear that even in the absence of the patriotic salvage drives the United States would have produced enough scrap iron and steel to supply its steel industry and to equip its fighting forces. Strategic choice also played a role. The German and Japanese strategy relied on quality of armies and armament to compensate for their deficiencies in the quantity of overall resources. Source: Mark Harrison: "The economics of World War II: an overview", in: The Economics of World War II: Six Great Powers in International Comparison, pp. 1-42. Edited by Mark Harrison. Cambridge: Cambridge University Press, 1998. These numbers look largely the same for strictly war materials like weapons and ammunitions. Such a large head start is quite an argument against any real material "need for large drive". The denunciation of the Japanese-US treaty on trade and shipping in July 1939, and its lapse in January of the following year, dealt a severe blow to the Japanese wartime economy which relied heavily on America for machine tools, scrap iron, and many other commodities for military use. Akira Hara: "Japan: Guns before Rice", in Mark Harrison (Ed. ): "The Economics of World War II: Six Great Powers in International Comparison", Cambridge: Cambridge University Press: Cambridge, New York, 1998, p238. Only at the outset of the war—and only for a limited number of materials—there was even any real use for the scrap drives on the materialistic side of the equation. Some metals were successfully recycled and needed. For fat, rubber and aluminium the drives were a waste of resources except for the morale component. The overall indirect effects, different from "procurement of raw materials? ", seem non-negligible. Frugality as an expression of support for a common cause, awareness for material needs in the war effort and so on. Strictly on a materialist basis these "drives" did not accomplish the effects they were expected to achieve and these were also not really needed in hindsight. Global statistics render these efforts not "unhelpful", rather largely "insignificant". Perhaps a clarification: That does not mean that "recycling" was unimportant or unnecessary. This is purely about the "drives" and their impact. The drives, it turns out, had a more limited impact on the economy than might be imagined from some of the enthusiastic portrayals in the popular and historical literatures. At most, the drives increased scrap collections by relatively small margins above what would have been collected during a prosperous peacetime period. The impact of economic incentives on the supply of scrap materials, and the impact of the maneuvering of special interests for advantage, moreover, can be seen at every turn. If the drives were important it was through their impact on civilian morale. The answer is specific to each metal; I will limit my answer to just tin. It has been noted that the United States consumes, and has consumed annually for many years, about half of the total world tin consumption. Yet, exploration has indicated that, except in the extreme North and South, the North American continent has no commercial deposits. During World War II more than one-third of the total tin consumed was secondary tin derived from scrap and salvage. So for tin specifically, since North America had no natural supply, and most supply regions such as Malaysia were under enemy control, scrap was very important. Not the answer you're looking for? Browse other questions tagged united-states history propaganda . Were there Hungarian speaking Indians in South America? Do babies from the United States cry more then babies in other parts of the world?